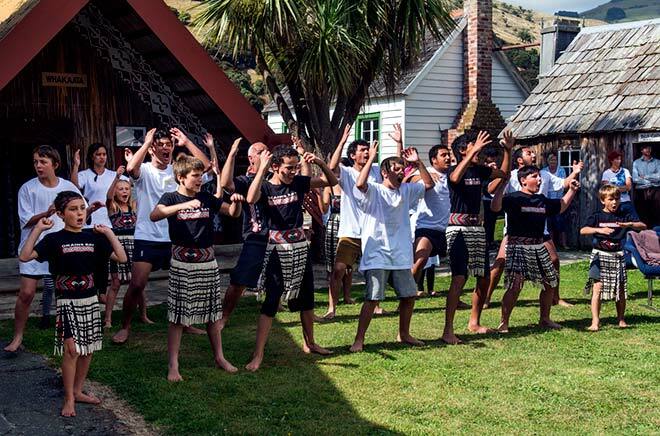 Local iwi welcome guests at the Whakaata Marae, attached to the Okains Bay Māori and Colonial Museum on Banks Peninsula, on 6 February 2014. The museum was opened in an old cheese factory in 1977 and a new Whare Taonga was built to house the extensive Māori collection. Each Waitangi Day there is a pōwhiri (welcome), speech and a hāngī, and the museum’s waka is paddled up the river. Although the Māori population of Canterbury is not large, Okains Bay is one of the places where Māori culture is respected and promoted.